There is something unique about the release of any new Stryper album. Stryper, at one time, was the equivalent of P.O.D. in their Satellite days. Stryper sold millions of albums in the 80s, and changed the face of Christian rock that demanded more recognition and respect. It wasn't an easy life for the band, and in 1990, Stryper released Against the Law. The album was a complete departure from anything Stryper had released in the past. It had mild curse words, and unlike their previous efforts, it had very little mention of Jesus. It was aimed primarily at the mainstream with very little success. People were wondering if we would ever see those yellow and black stripes again. Fortunately, Stryper made a comeback to the Christian market in 2005 with Reborn. 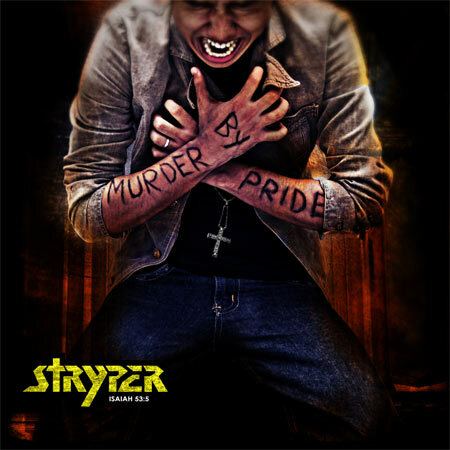 Four years later, Stryper contributes another follow-up with the all-new Murder by Pride. Reborn did not seem like a sequel to any of Stryper's past projects. It displayed a post-Grunge sound with some classic Styper elements. However, there are moments in Murder by Pride that sound more like classic Stryper. The harmonies are more prevalent (a Stryper trademark that began on the Yellow and Black Attack), Michael Sweet's screams return, and the guitar solos are much more memorable. "Eclipse for the Sun" is an upbeat song to begin the album. Although it's not the best material found on the record, this song has an incredible closure in the last minute as the drums slow down and we hear a really great guitar composition (I actually find myself fast-forwarding to the 2 minute, 30 second mark with every listen). "4 Leaf Clover" recalls music from the song "To Hell with the Devil" with some changes to the sound. The song illustrates how people have a misguided faith in things rather than God. Next, Stryper executes a very nice cover of Boston's "Peace of Mind," serving as definitely one of the highlights on this album. It just would not be a Stryper album without at least one ballad. The ballads "Alive" and "I Believe" fall into the same category as Stryper's "Honestly," "Together as One," or "Always there for You." "I Believe" will be an instant favorite because it has a nice balance of being a ballad while containing some really good guitar work from Oz Fox. "The Plan" covers the topic of a person who wants to follow the right path in the way God wants them to, "I want to be the man/ the one I know you see/ I want to live the plan/ the one with you and me." "Murder by Pride," the album's title track, will recall the heavy riffs from Stryper's "To Hell with the Devil," another title track. Much like Stryper's last album, they save one of the best tunes for last, a remake of "My Love (I'll Always Show)". Stryper has completely revamped the sound by changing a once very soft ballad in a full force hard rock song, but it works very well. Instead of trying to completely change their sound this time around, Stryper has brought us an album that re-establishes their original sound while implementing some modern music characteristics. It's not a perfect album by any means, but it is an enjoyable project that improves with each session. Some tracks, such as "Everything" can grow tiresome rather quickly because the phrase "to (know you), to (here you), to (touch you)" is repeated throughout the entire song (along with many other "to" phrases). Stryper seemed to have had a lot of fun creating this album, and it's definitely an improvement over Reborn. While the record may not guarantee new fans, the original Stryper fans should be very satisfied with Murder by Pride.